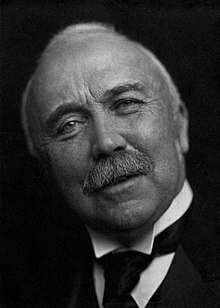 Sir Henry Campbell-Bannerman GCB (September 7, 1836 – April 22, 1908) was a British Liberal statesman who served as Prime Minister from December 5, 1905 until resigning due to ill health on April 3, 1908. No previous First Lord of the Treasury had been officially called "Prime Minister"; this term only came into official usage after he took office. In the 1906 general election he led the Liberal Party to their biggest ever majority. Liberal politics meant the politics of common-sense. The Spectator (17 February 1984), pp. 223-224, quoted in John Wilson, C.B. : A Life of Sir Henry Campbell-Bannerman (London: Constable, 1973), p. 230. What do we mean by this Liberalism of which we talk? … I should say it means the acknowledgement in practical life of the truth that men are best governed who govern themselves; that the general sense of mankind, if left alone, will make for righteousness; that artificial privileges and restraints upon freedom, so far as they are not required in the interests of the community, are hurtful; and that the laws, while, of course, they cannot equalise conditions, can, at least, avoid aggravating inequalities, and ought to have for their object the securing to every man the best chance he can have of a good and useful life. The Liberal Magazine (January 1898), p. 530, quoted in John Wilson, C.B. : A Life of Sir Henry Campbell-Bannerman (London: Constable, 1973), p. 232. I am half-surprised to find that as I go on I get more and more confirmed in the old advanced Liberal principles, economic, social, & political, with which I entered Parliament 30 years ago. Letter to John Spencer (19 February, 1900), quoted in John Wilson, C.B. : A Life of Sir Henry Campbell-Bannerman (London: Constable, 1973), p. 326. What is that policy? That now that we had got the men we had been fighting against down, we should punish them as severely as possible, devastate their country, burn their homes, break up their very instruments of agriculture.. It is that we should sweep – as the Spaniards did in Cuba; and how we denounced the Spaniards! – the women and children into camps...in some of which the death-rate has risen so high as 430 in the thousand. I do not say for a moment, because I do not think for a moment, that this is the deliberate and intentional policy of His Majesty's Government...at all events, it is the thing which is being done at this moment in the name and by the authority of this most humane and Christian nation. Yesterday I asked the leader of the House of Commons when the information would be afforded, of which we are so sadly in want. My request was refused. Mr. Balfour treated us with a short disquisition on the nature of war. A phrase often used is that "war is war", but when one comes to ask about it one is told that no war is going on, that it is not war. When is a war not a war? When it is carried on by methods of barbarism in South Africa. Speech at the Holborn Restaurant (14 June, 1901), quoted in John Wilson, C.B. : A Life of Sir Henry Campbell-Bannerman (London: Constable, 1973), p. 349. Letter to Herbert Gladstone on Rosebery's speech advocating national efficiency collectivism (18 December, 1901), quoted in John Wilson, C.B. : A Life of Sir Henry Campbell-Bannerman (London: Constable, 1973), p. 371. Speech to the Cobden Club denouncing the Brussels sugar convention (28 November, 1902), quoted in The Times (29 November, 1902), p. 12. We are keenly in sympathy with the representatives of Labour. We have too few of them in the House of Commons. ...The Liberal party, high and low, have discovered, if they ever forgot it, that the real road to success...lies in adhering to the old principles of the party. We are satisfied that it is right because it gives the freest play to individual; energy and initiative and character and the largest liberty both to producer and consumer. ...trade is injured when it is not allowed to follow its natural course, and when it is either hampered or diverted by artificial obstacles. ...We believe in free trade because we believe in the capacity of our countrymen. That at least is why I oppose protection root and branch, veiled and unveiled, one-sided or reciprocal. I oppose it in any form. Besides we have experience of fifty years, during which our prosperity has become the envy of the world. Speech at Bolton (15 October, 1903), quoted in John Wilson, C.B. : A Life of Sir Henry Campbell-Bannerman (London: Constable, 1973), p. 413. The right hon. gentleman is like the Bourbons. He has learned nothing. He comes back to this new House of Commons with the same airy graces – the same subtle dialectics – and the same light and frivolous way of dealing with great questions. He little knows the temper of the new House of Commons if he thinks those methods will prevail here. The right hon. gentleman has...asked certain questions which he seemed to think were posers. ...I have no direct answer to give to them. They are utterly futile, nonsensical and misleading. They are invented by the right hon. gentleman for the purpose of occupying time in this debate. I say, enough of this foolery. … Move your amendments and let us get to business. Speech in the House of Commons answering A. J. Balfour (12 March, 1906), quoted in John Wilson, C.B. : A Life of Sir Henry Campbell-Bannerman (London: Constable, 1973), p. 497. ...the concentration of human beings in towns...is contrary to nature, and...this abnormal existence is bound to issue in suffering, deterioration, and gradual destruction to the mass of the population...countless thousands of our fellow-men, and still a larger number of children...are starved of air and space and sunshine. ...This view of city life, which is gradually coming home to the heart and understanding and the conscience of our people, is so terrible that it cannot be put away. What is all our wealth and learning and the fine flower of our civilisation and our Constitution and our political theories – what are all these but dust and ashes, if the men and women, on whose labour the whole social fabric is maintained, are doomed to live and die in darkness and misery in the recesses of our great cities? We may undertake expeditions on behalf of oppressed tribes and races, we may conduct foreign missions, we may sympathise with the cause of unfortunate nationalities; but it is our own people, surely, who have the first claim upon us...the air must be purified...the sunshine must be allowed to stream in, the water and the food must be kept pure and unadulterated, the streets light and clean...the measure of your success in bringing these things to pass will be the measure of the arresting of the terrible powers of race degeneration which is going on in the countless sunless streets. Speech in Belmont (25 January, 1907), quoted in John Wilson, C.B. : A Life of Sir Henry Campbell-Bannerman (London: Constable, 1973), p. 588. I think it will be felt by the community as a whole as if they had lost a relative. Certainly those who have been associated with him closely for years will feel a deep sense of personal bereavement. I have never met a great public figure since I have been in politics who so completely won the attachment and affection of the men who came into contact with him. He was not merely admired and respected; he was absolutely loved by us all. I really cannot trust myself to say more. The masses of the people of this country, especially the more unfortunate of them, have lost the best friend they ever had in the high places of the land. His sympathy in all suffering was real, deep, and unaffected. He was truly a great man—a great head and a great heart. He was absolutely the bravest man I ever met in politics. He was entirely free from fear. He was a man of supreme courage. Ireland has certainly lost one of her truest friends, and what is true of Ireland is true of every section of the community of this Empire which has a fight to maintain against powerful foes. David Lloyd George upon Campbell-Bannerman's death, quoted in The Times (23 April 1908), p. 5. This page was last edited on 23 July 2018, at 00:04.